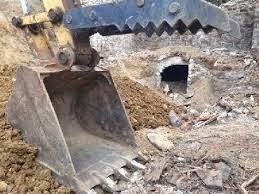 News---Middletown, Dauphin County, Pennsylvania: Has It Uncovered An Underground Railroad Underground Tunnel? A contractor stumbled upon a mysterious tunnel in Middletown Borough recently. News 8's Porcha Johnson took a closer look at how it was found and what's inside. Lincoln's Bishop: A President, A Bishop and The Fate of 330 Sioux Warriors, Gustav Niebuhr, 244pp., HarperOne Publishing, $26.99. From The Publisher: Gustav Niebuhr's compelling history of Abraham Lincoln's decision in 1862 to spare the lives of 265 condemned Sioux men, and the Episcopal bishop who was his moral compass, helping guide the president's conscience. More than a century ago, during the formative years of the American nation, Protestant churches carried powerful moral authority, giving voice to values such as mercy and compassion, while boldly standing against injustice and immorality. Gustav Niebuhr travels back to this defining period, to explore Abraham Lincoln's decision to spare the lives of 265 Sioux men sentenced to die by a military tribunal in Minnesota for warfare against white settlers—while allowing the hanging of 38 others, the largest single execution on American soil. Popular opinion favored death or expulsion. Only one state leader championed the cause of the Native Americans, Episcopal bishop, Henry Benjamin Whipple. Though he'd never met an Indian until he was 37 years old, Whipple befriended them before the massacre and understood their plight at the hands of corrupt government officials and businessmen. After their trial, he pleaded with Lincoln to extend mercy and implement true justice. Bringing to life this little known event and this extraordinary man, Niebuhr pays tribute to the once amazing moral force of mainline Protestant churches and the practitioners who guarded America's conscience. It is hard to recall what powerful moral voices Protestant church leaders had in the formative years of the nation. Gustav Niebuhr travels back to the Minnesota frontier of 1862 when Dakota Sioux rose up against pioneering families and slaughtered hundreds. Citizens demanded mass executions and deportations. Into this turmoil stepped Henry Benjamin Whipple, the state's first Episcopal bishop. Whipple had already loudly decried the crimes and corruption of those managing Indian affairs and warned of calamity. Now he made the case of mercy and a deeper justice, which eventually led to meeting with President Lincoln. Despite being preoccupied with the Civil War, Lincoln was moved to intervene, surprisingly taking the time to review all 303 cases and overturning the death sentence for most of the Indians. Nevertheless, the result was still the largest single execution on American soil. If not for Whipple's vigorous campaigning, both in state and in Washington, DC, a greater tragedy might well have occurred. His success should haunt us: Where today do we hear these trumpet calls for justice like those given by figures such as Bishop Henry Benjamin Whipple? Maney's Confederate Brigade At The Battle of Perryville, Stuart W. Sanders, History Press, 40 illustrations, 5 maps, endnotes, index, $19.99. Stuart W. Sanders, the author of The Battle of Mill Springs Kentucky and Perryville Under Fire: The Aftermath of Kentucky's Largest Civil War Battle, continues to offer clear and concise work on the Civil War in Kentucky.Sam Watkins of the First Tennessee Infantry who after the war became the author of Company Aytch stated the the battle was the hardest fought battle in which that he had participated. Relying equally upon secondary histories of the battle and primary sources of the eyewitness, Sanders' presents a moving account of a Confederate brigade that suffered over 50% in casualties. Consisting of Tennessee and Georgia soldiers, Maney lead two separate assaults in which two Federal generals were killed, two artillery positions were overrun and caused the Federal left to nearly collapsing. Sanders' narrative captures both the momentum and exhaustion of the Confederate brigade. Additionally, Sanders opens up the issues and even hostility that Confederate regimental, brigade and division commanders could show each other. Though the Maney's brigade gave a stellar effort during the battle, other commanders laid complaints against Maney and afterward a duel was fought between Maney and a surgeon. The author also presents an interesting discussion of how the citizens of Perryville dealt with the bodies and the wounded after the battle. 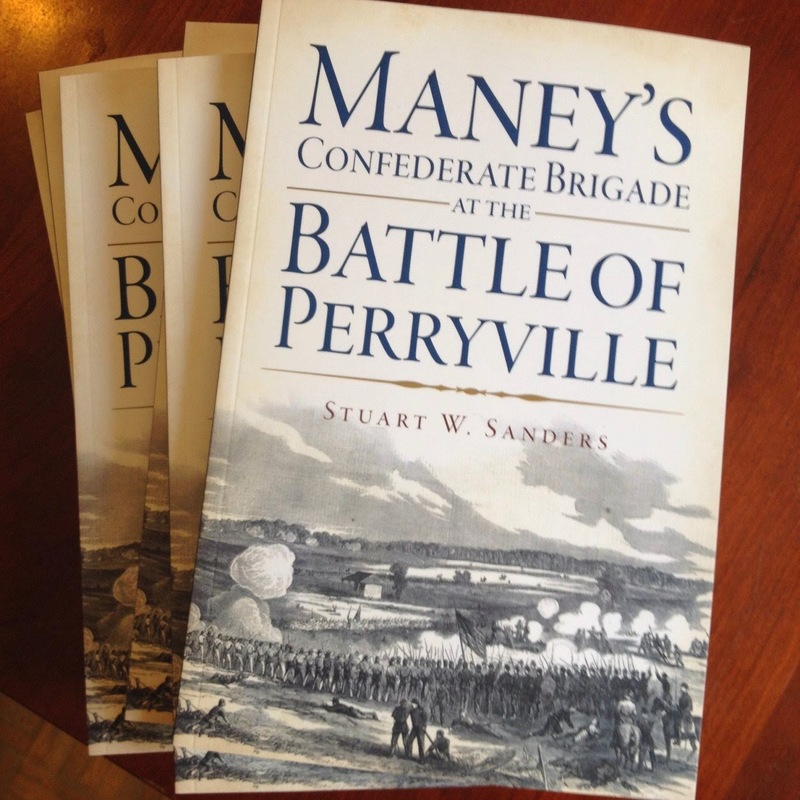 Stuart W. Sanders' Maney's Confederate Brigade At The Battle of Perryville is accessible to general readers. Those interested in both a cogent presentation regarding Tennessee and Georgia troops and the Civil War west of the Appalachian Mountains will be pleased. News--Is The Confederate States' Hunley Ready To Reveal Itself? Hunley Finally Ready To Reveal Itself, Brian Hicks, Post And Courier, May 1, 2014. The H.L. Hunley may not hide its secrets for much longer. Today, scientists at the Warren Lasch Conservation Center will immerse the Civil War-era submarine in a caustic bath of sodium hydroxide and water to begin a long-awaited conservation process that is expected to last about five years. 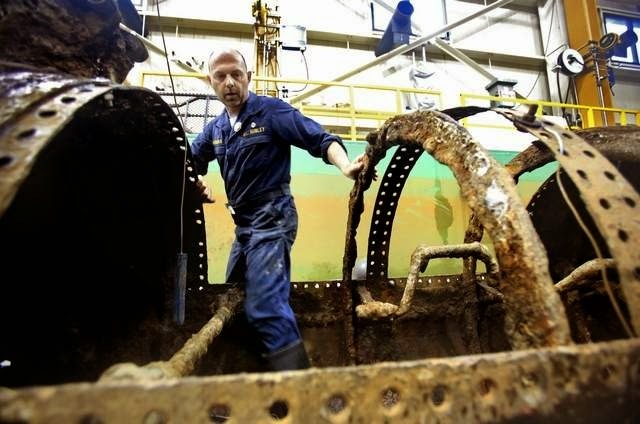 But within a few months, conservators and archaeologists expect to get their first look at the sub's iron hull - and it may hold clues that finally reveal why the Hunley sank off Charleston 150 years ago. "We have been waiting for this for years," said conservator Nestor Gonzalez. "Everything we're doing here is to preserve the Hunley as it was and to preserve information recorded on the sub. Now we will finally get to see the hull." 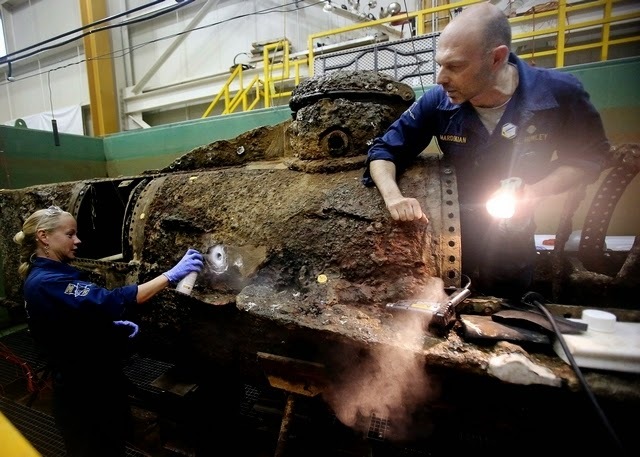 The Hunley conservation project is one of the most complicated in maritime history. This is the only complete ship to ever be conserved in this fashion, and it may be the largest artifact ever preserved with sodium hydroxide. It will test the capabilities of one of the most advanced maritime conservation facilities in the world. The 40-foot iron submarine is a complex piece of machinery with hundreds of nooks and crannies that will have to be preserved to prevent the sub from rusting away. The first step will be the most revealing. In the 136 years that the Hunley lay buried beneath the Atlantic seabed, a hard layer of sand and shell formed on the hull. That concretion, as scientists call it, has protected the Hunley - but it also obscured many details of the hull. The concretion has been left on the sub since its recovery in 2000 for protection. Gonzalez expects the sodium hydroxide will take only a few months to loosen the hardened sediment enough to allow scientists to scrape it off. Scraping could take months, even with a team of conservators working daily. Michael Scafuri, Hunley archaeologist, said the concretion has been mapped, photographed and recorded with 3-D imaging to make sure they have every bit of information possible from the Hunley's protective shell. And now they are ready to see what lies beneath. "Under that concretion is the possibility of new information about the attack," Scafuri said. With the shell and sand removed, Scafuri said scientists should learn more about the Hunley's design and operations, and may be able to tell what caused the submarine to sink. The Hunley disappeared off Sullivan's Island on Feb. 17, 1864, shortly after it sank the Union blockader USS Housatonic by ramming a torpedo into its flank. It was the first successful submarine attack in history, but the mystery of what happened after has endured for a century and a half. The submarine was buried beneath the Atlantic seabed until 1995, when a dive team funded by Clive Cussler discovered it less than a mile from the Housatonic wreckage. Removing the concretion is perhaps the most anticipated step in the conservation process, but it is just the beginning. On Wednesday, scientists prepared the Hunley for its caustic bath and added giant jugs to the sub's tank to help with displacement and reduce the amount of chemicals and water needed by about 8,000 gallons. Gonzalez said the 76,000 gallon tank will be filled with a caustic mixture that is 99 percent water and 1 percent sodium hydroxide. That solution will start a chemical reaction that will extract salt from the iron hull - salt that soaked into it over a century. The solution will be changed out periodically until all the salt has been removed from the hull. At that point, it will be safe to display the Hunley without immersing it in water. This has been the conservation plan from the beginning, and scientists are committed to it. Gonzalez and the other scientists are excited to finally see the hull, but they are also a little worried about soaking a unique artifact in chemicals so dangerous the entire lab has had to be retrofitted for safety. The new safety measures are designed to protect the sub and the scientists, and to allow the lab to remain open for public tours. "It's like going in to your doctor for a basic procedure," Gonzalez said. "It's safe, but there's always a risk." But the greater risk, said Senior Conservator Paul Mardikian, is to do nothing. The cold water and mild electrical current that have preserved the sub for the past 14 years cannot protect it forever. "This is the only way to remove the salt," Gonzalez said. Mardikian said this is not just the only way to save the sub, it is the last chance to finally answer that nagging question: Why did the Hunley sink?